The bikes were festooned with a kaleidoscope of stuffed toys in every conceivable colour, shape and form. The toys were put in storage, where they have been counted and wrapped. On Monday, 2 December the toys will be delivered to over 200 homes for orphans and destitute children throughout the Western Cape, all in time for Christmas. 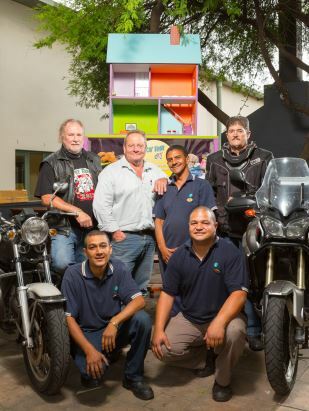 GrandWest staff donated a further 224 toys, GrandWest donated 100 Kids Fun Packs and the Engineering Department outdid themselves by building a doll house. Speaking about their contribution, Rodney January, Clive Cupido and Theo Prins said they got some guidance from their manager, Johan Gelderblom and other Engineering staff members. “It became a fun thing in our department. Maybe next year, we can build a boat or even a replica of the waterfront,” Clive said laughingly. 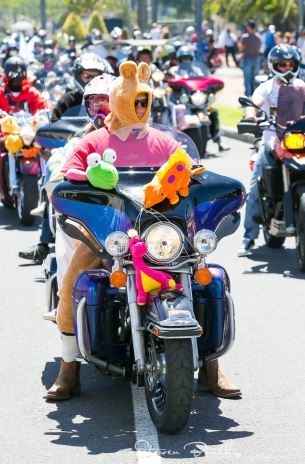 The annual event was started by the Italian Motorcycle Club 31 years ago with the express purpose of collecting toys for the Red Cross Children’s Hospital in Rondebosch. The inaugural event drew 34 bikers who donated 72 toys and this year, estimations are that as many as 37,000 toys will have been donated.